Eat Mushrooms! They are renowned for their antiviral and antibacterial benefits besides being a good source of protein at 3.3%. 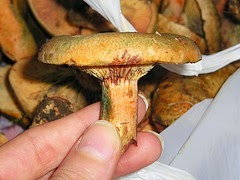 This means, for every 100 gms of mushroom you eat, you get 3.3 gms of high-quality nutritional protein. Mushrooms as edible fungi also have a long tradition of acting as medicinal agents of well being. Quick sidenote: The book on mushrooms by Christopher Hobbs documents the healing tradition and culture of over 100 edible varieties of mushrooms in both Eastern and Western civilizations. Back to health benefits -- Mushrooms are low in carbs, rich in selenium (34% RDA), along with zinc & manganese, which makes them a very healthy source of vegan nutrition. Their immunity boosting & flu-fighting properties are equally well known. Whether you're going vegan for health reasons, or if you're a bodybuilder embracing the vegan lifestyle, the main thing to keep in mind is that a "mix-and-match" approach always works best for that ideal muscle-building diet that supports strength and endurance workouts. At the same time, for gaining muscle and getting fit, all you need is to be able to get 1 gm of protein for every pound of your body weight (or 2.5 gms protein for every kg of body weight). Mushrooms can easily help you reach that goal when combined with other sources of dietary and supplement protein.